The 2-Day Crevasse Rescue School is a comprehensive course designed to give you the knowledge and skills to perform basic and advanced mountaineering skills on your own. 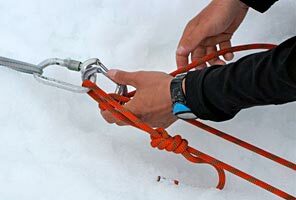 The first day is spent going over useful knots and hitches, snow and ice anchor systems, belaying, ascending, descending and crevasse rescue at our Ashford facility (directions). The following day we train on Mt. Rainier reviewing the basic skills from the previous day, and continuing on to more advanced rescue systems. This may either be at a crevasse or steep snow cornice depending upon the conditions of the glacier and time of year. Skills taught during the two days will include climbing knots, snow and ice anchors, ascending and descending ropes, simple crevasse rescue, advanced crevasse rescue systems, and crevasse self rescue. A generous amount of time is allotted for practice of these systems so all participants leave the course with greater confidence in their newly learned skills, and the ability to perform them in real life situations. We feel this is the most comprehensive crevasse rescue course offered in the industry! The program is an excellent opportunity to study practical basic mountaineering skills and advanced crevasse rescue systems in depth. Your instructors are experienced mountain guides who have amassed an impressive amount of time in glaciated terrain, using these techniques. The 2-Day Crevasse Rescue School allows plenty of time for learning and practicing skills in order to truly understand and be able to use them in practical situations on your own. This course, combined with our Mountaineering Day School and Advanced Mountaineering Day School can provide the start to a solid foundation for attempting glaciated climbs with or without guides. There is simply not enough time to learn and practice simple and complicated crevasse rescue systems in one day. This program is hands-on, and we minimize the amount of time spent traveling to maximize our learning. If you are an aspiring glacier climber, this course teaches skills mandatory for proper climbing. There are no prerequisites for this program. However, if your reason for taking this course is climbing glaciated peaks without a guide, we highly recommend combining it with the Mountaineering Day School. The Mountaineering Day School is an excellent introduction to alpine climbing techniques and, in combination with our 2-Day Crevasse Rescue School, can provide the start to building a solid foundation for climbing on your own.